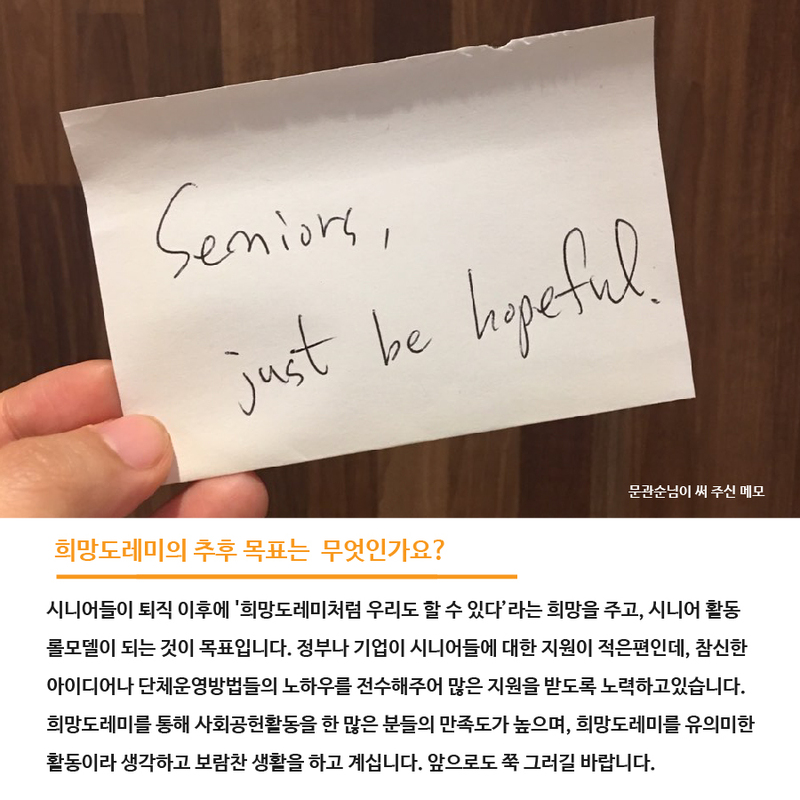 For a more meaningful senior life “Hope Doremi”. 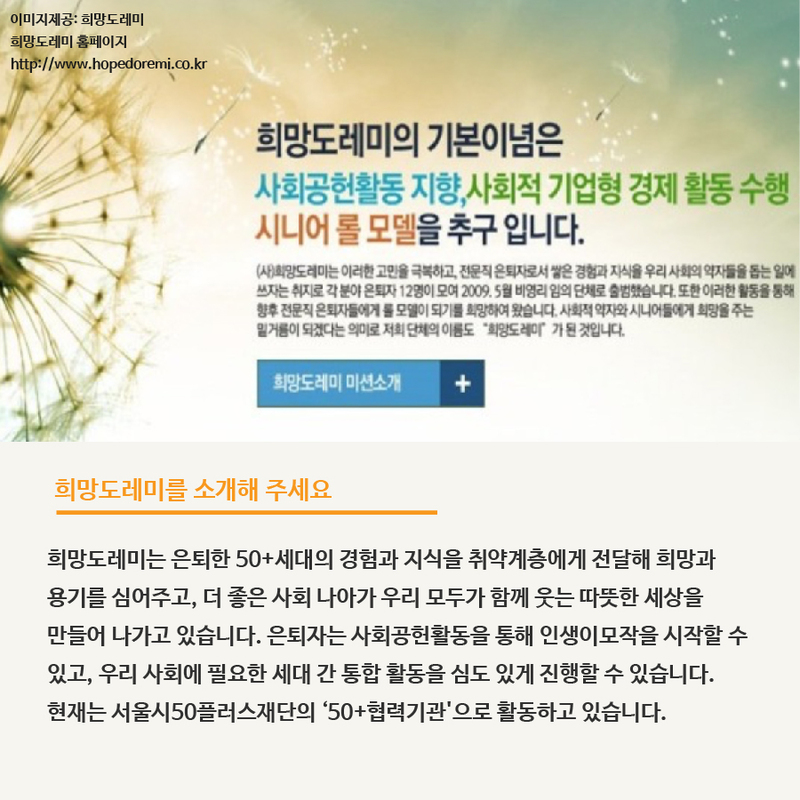 An interview with Shin Joon-sik and Moon Kwan-soon, the project leader of the Hope Doremi Community Fund Activity. “What should I do after retirement?” There are senior citizens who are worried and anxious in dealing with their life after retirement. The corporation, “Hope Doremi” helps in dealing with these worries and prepares worthwhile activities for seniors. 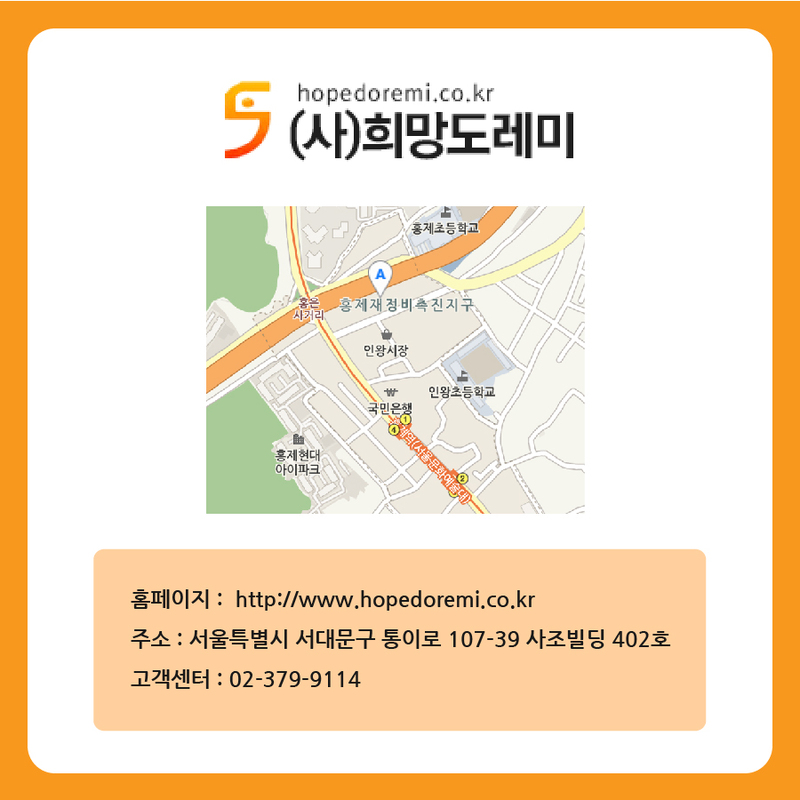 “Hope Doremi” is welcoming life-stage changing seniors to the Seodaemun 50 Plus Center. 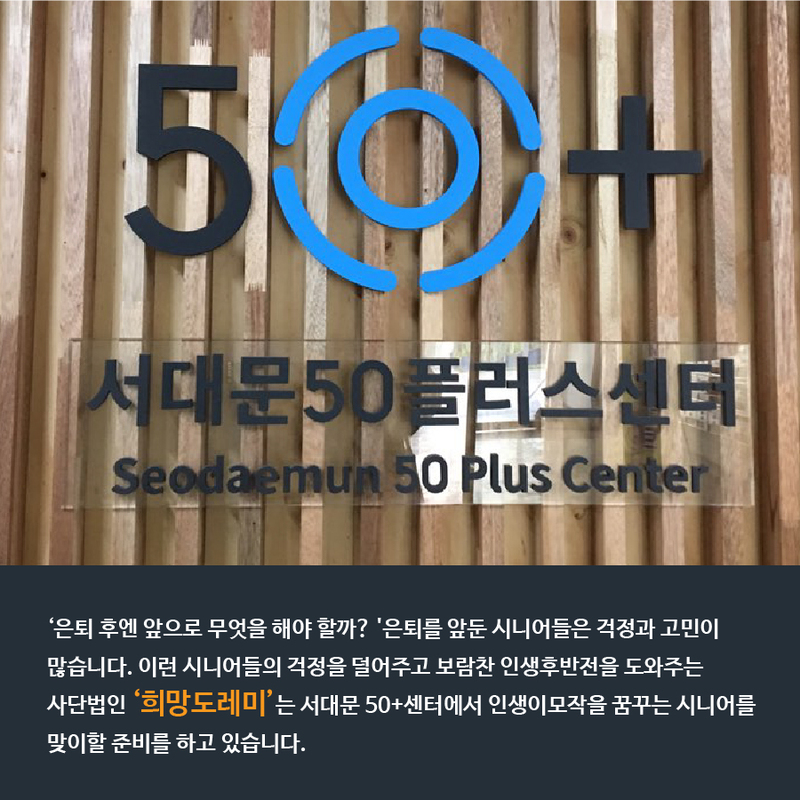 The Seodaemun 50 Plus Center, where the “Hope Doremi” office is located, providing a space for senior citizens so that they can interact with each other easily. Shin Joon-sik and Moon Kwan-soon, the project leader of the Community Fund Activity received the interview. “Hope Doremi” brings hope and courage to the 50+ generations by passing on their experiences and knowledge to the vulnerable, building a better society and warm world together. Retired senior citizens can start life modeling through society contribution activities, and they can go further into intergenerational integration activities, which is needed in our society. 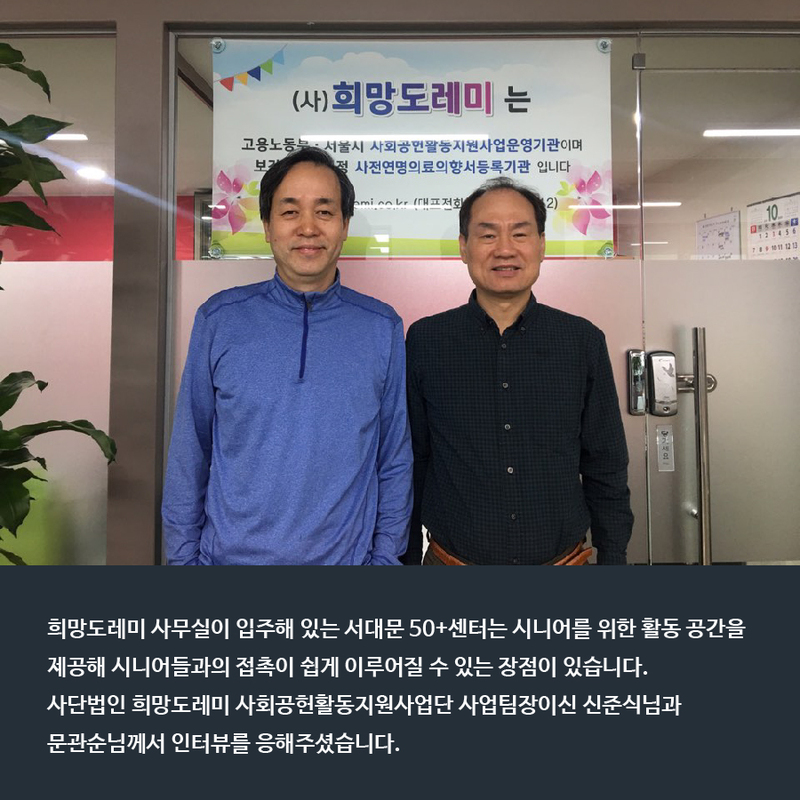 Currently, activities are carried out under “50 Plus Partnership” of Seoul City 50 Plus Foundation. What does “Hope Doremi” do? “Hope Doremi” does variety works for senior citizens. For example, supporting society contribution activities by utilizing knowledge and experiences of professional retired personnel. “Hope Doremi” also matches places where need help to share the talents of retirees. It also supports society contribution activities and support the education of learning the necessary talent. 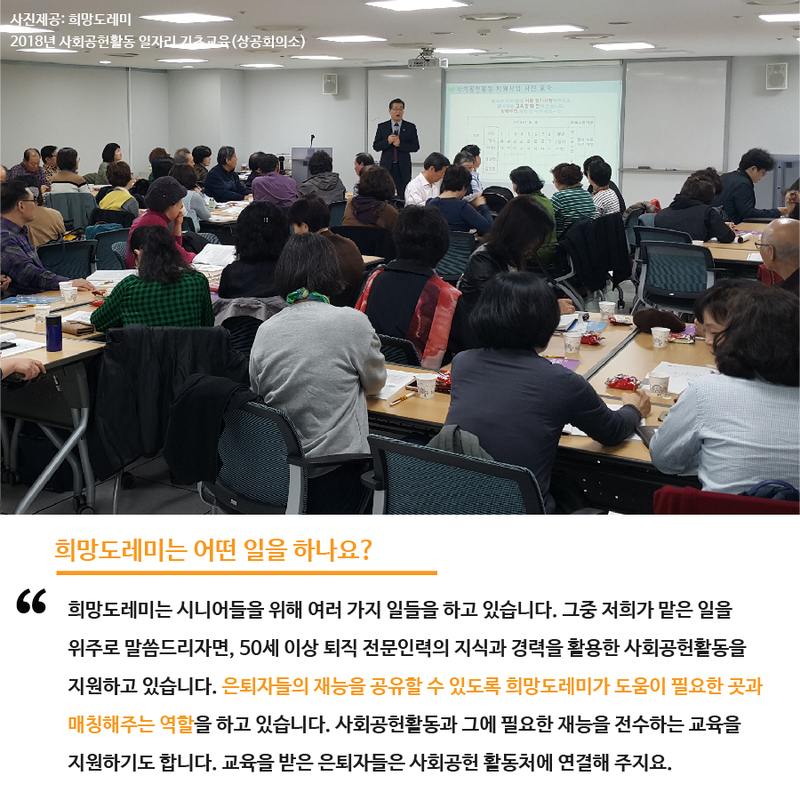 The retirees who accept the education are connected with the Society Contribution Activity Agency. In addition, “Hope Doremi” has launched a community service team to help the vulnerable through organizations “Sharing love” and “A Happy Together Community”. Recently, 'Rice Delivery Activity' has been carried out in which rice was donated by Seodaemun District Office and shared among 14 places in Seodaemun. We are trying to establish communication between generations through activities such as etiquette education and cooking class by trained senior citizens at Child Support Center. What kind projects are you currently working on? 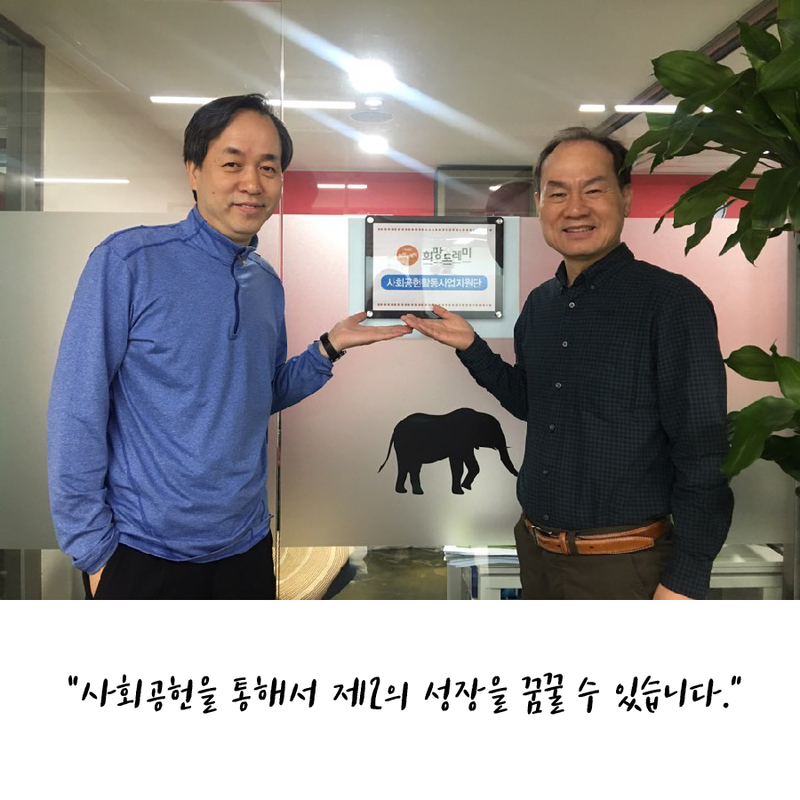 Along with the “Seoul City 50 Plus Foundation” and “Kakao-like values”, a webtoon called “Second Spring” is made. Through the gaze of one’s father, we will be dealing with the worries as well as dreams of 50’s, and communication between children and their parents. 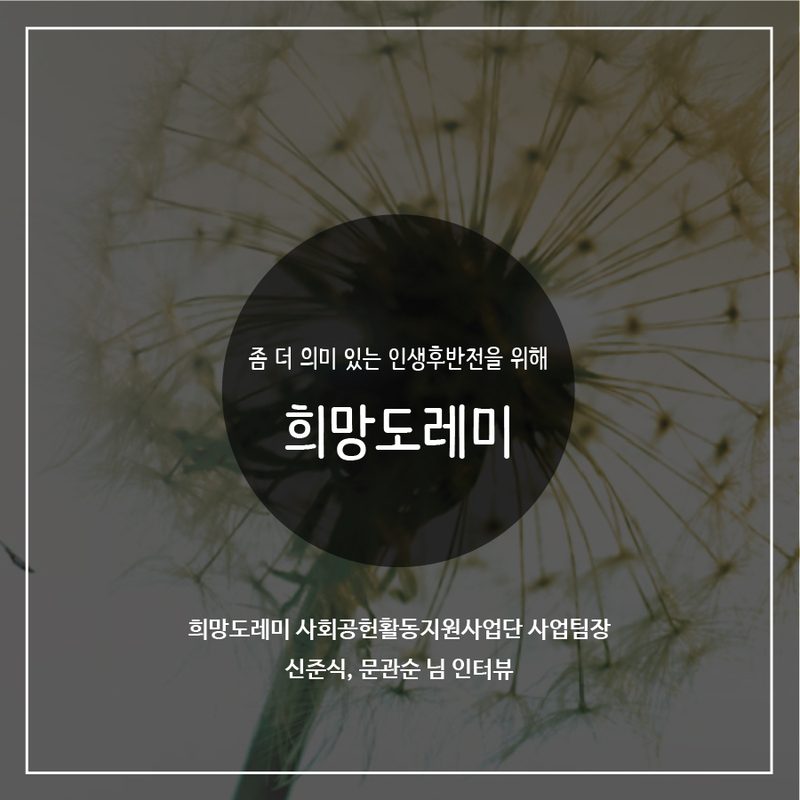 Webtoon fee is funded through the sponsorship of “Kakao-like values”. In addition, in the first half of next year, 'Society Contribution Job Fair' will be held to share some best examples of society contribution jobs, and booths will be set up where 50+ generation will introduce and give consult on careers. What are the future goals and visions of “Hope Doremi”? The goal is to give retired senior citizens the hope that “we can do it” as well as becoming role models. Although government and businesses provide little support, we are trying to give a lot of support to senior citizens in delivering new ideas and know-how to operate groups. Many people who have done society contribution activities through “Hope Doremi” are highly satisfied, thinking that it is a significant activity and live a fruitful life. I hope things will continue in the future. "We can dream of a second growth through society contribution." A professional senior society contribution organization that leads the era of 100 years as an active senior who takes the great step of hope. Help and give hope to the vulnerable by utilizing experiences and knowledge of the 50+ generation and pursue a role model for society contribution activities of the 50+ retirees.